Monika and Karel received a small business loan through Mercy Corps Northwest 10 years ago, and used the money to launch their food cart, Schnitzelwich. Mercy Corps Northwest is the domestic branch of the internationally known aid organization, Mercy Corps International. Here in Oregon, MCNW works on several fronts to improve individual lives and communities. Their flagship programs are small business support; the Reentry Transition Center for individuals coming out of prison; a refugee garden program; and a small business class for incarcerated women. There is a remarkable common thread running through these disparate projects: a clarity of purpose and an empowerment model that leaves clients with a sense of their ability to pursue and achieve their goals. 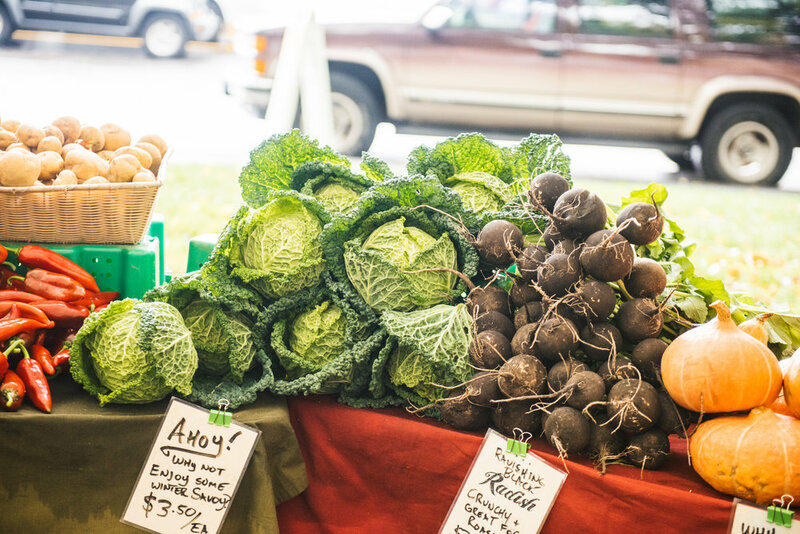 In 2015, MCNW supported hundreds of entrepreneurs in starting and building businesses; over 1,000 ex-offenders in reentering the Portland community, and 60 refugee participants in the Refuge Garden project, with a $6,000 average family income from produce sales. 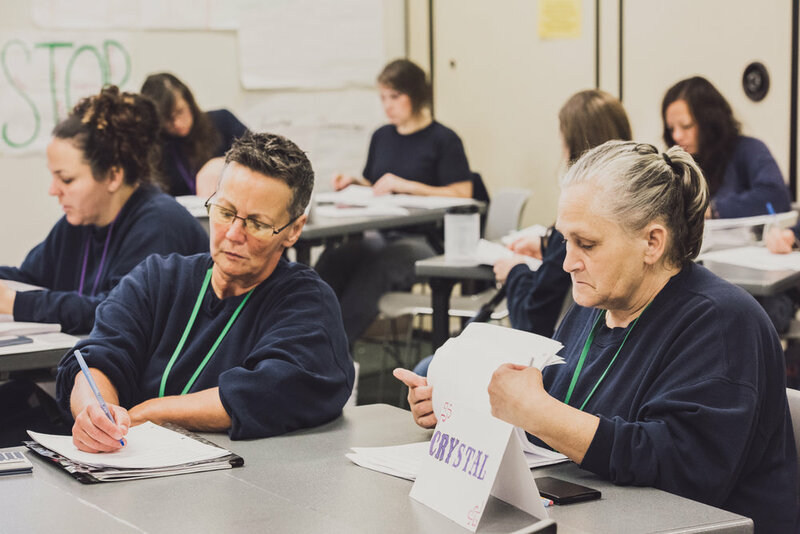 LIFE class at Coffee Creek Correctional Facility, teaching entrepreneurship and business skills to incarcerated women. Offered through Mercy Corps Northwest. We were asked to create a series of client portraits and profiles we titled “Picturing Mercy Corps Northwest.” In the process, we met with individuals involved in all four programs to take photos and hear their stories. We were invited into the vibrant heart of MCNW’s work, and met some truly exceptional individuals. 16 of these client profiles were selected to be printed (at nearly 3’ x 4’!) and displayed at the Mercy Corps headquarters in downtown Portland. They were part of the end-of-year party celebrating volunteers, staff, and clients, but they will also be on display as an installation in 2016 (check back for more details). The Refuge Garden project, working with recent refugees from Bhutan and Myanmar in Southeast Portland. Project through Mercy Corps Northwest. In addition to these printed portraits, our photos and writing will also be used on the MCNW website, in outreach materials, on social media, and in their annual report. We are delighted that our early project with the Reentry Transition Center led us to this work with Mercy Corps Northwest! As we met with individuals in the small business program, the Reentry Transition Center, the Refuge Gardens, and the LIFE class at Coffee Creek Correctional Institution, we witnessed how these programs inspire and empower their clients. The individuals we spoke with had a clear sense of their goals—and a well-considered path to achieve them. We were welcomed into homes and businesses, life-giving garden spaces and a lively discussion at Coffee Creek Correctional Facility. We were offered food and coffee, and invited to understand people’s journeys. The LIFE class offers women who are nearing the end of their sentences a chance to build skills and knowledge of running a small business. In the process, they not only discuss budgeting, accounting, loan applications, taxes, and income projections, but also broader life skills like communication, goal setting, and self-care. We spent two days at Coffee Creek, first sitting in on a dynamic class discussion, and then interviewing participants. Both days we were struck by how engaged, motivated, grounded, and collaborative these women are. Ebony radiates joy. She is a current member of the LIFE class, and post-release hopes to open a hair braiding and hair design business. She told us, "There's basically nowhere that offers these services in the small towns between Portland and Salem. I was the only African American kid growing up, and no one could tell me about caring for my hair, or about my heritage and culture. There are lots of immigrants in those communities now, and lots of biracial kids that could use those services and someone to teach parents as well. I want to serve my community in that way." Shelly is incredibly motivated--in addition to the LIFE class, she has also been part of welding and carpentry programs, a firefighting team, the puppy training program, Portland Community College classes, a Habitat for Humanity tiny house construction program, and a self-directed project building furniture from shipping pallets. Shelly is an impassioned advocate for tradeswomen and pre-apprentiship programs for women in prison, and has been a public speaker on the issue during her incarceration. MCNW offers a wide array of programs supporting entrepreneurs. Business classes include foundational skills courses, accounting, internet marketing, and more, and also offer a specialized program for Russian-speaking entrepreneurs. Microloans support businesses that do not qualify for more conventional funding. Matched savings grants can triple low-income business owners’ resources. We met incredible individuals through this program. Robin practiced martial arts for years, rising to considerable success as an amateur flyweight in Mixed Martial Arts, with a record of 6-1 and holding the title of FCFF Superfight Champion. However, her love for the sport was offset by misogyny and negative attitudes among the people she competed with. She decided to either start her own gym or quit the sport. She said, "I was funding my dream with credit cards. I wasn't in a position for a home equity loan or conventional funding. If Mercy Corps Northwest hadn't given me a loan, I would have had nothing to go on--I probably would have just had friends training in my garage." Marina and her family came to Oregon in 2000 as Uzbekistani refugees. They were fleeing violence and religious oppression, and arrived in the US with $200 in their pockets. They struggled to find stable work and housing, but then received a Mercy Corps Northwest IDA grant to purchase a vehicle, which proved to be a turning point for the family. More recently, Marina took a Business Foundation class through MCNW that was offered in Russian--perfect for her as her English isn't strong. She runs a cleaning business, and used the knowledge from the class to streamline her accounting, taxes, and business plans. Her sons work in construction, and this photo was taken in her recently-rennovated kitchen, of which she was very proud. Our work for Picturing Mercy Corps Northwest was our second experience with the Reentry Transition Center. As with our previous visits, we were struck by the welcoming and encouraging atmosphere of the organization, and the way the navigators worked together with clients to facilitate their success post-incarceration. The people we spoke with for this project were focused on overcoming the many challenges of reentering the community: finding jobs, rebuilding ties with family, securing stable housing, and developing positive community and plans. Warren told us, "Prison always felt like a permanent part of my life before. I was so angry, but now I'm 52 and tired of prison." He has spent almost 30 years of his life incarcerated, beginning when he was 11 years old. His most recent stint lasted over 17 years. He spoke about cycles of anger and aggression, and how he has finally envisioned a successful life on the outside. The RTC helped him get his birth certificate, ID, and new clothes. He hopes to become a youth counselor in Multnomah County, where he was incarcerated as a young man. Shortly before her high school graduation, Sammie received a call saying that her younger sister was in trouble. The ensuing fight resulted in Sammie being convicted of second degree assault--a crime with a mandatory minimum sentence of 70 months. Almost 6 years later, she is a graduate of the LIFE class and a client at the RTC who epitomizes confidence and optimism. Her navigator recommended her for a job, so she is now working and planning to pursue a business degree. She said, "It is because of these programs that I have confidence in myself." Refugees often face intense challenges in finding their place in the community. Depending on the individual’s past experiences, they often are living with trauma and culture shock while facing challenges in securing work and finding a place in the community.The Refuge Gardens Project provides gardeners with important and empowering work while also ensuring that they can access healthy, organic produce for their own consumption as well as income from sales in local farmer’s markets. Tee Mu spent the first twenty years of her life in a small village in Myanmar. Then Burmese soldiers began attacking the area, capturing her neighbors, assaulting the women, and burning homes and crops. She and her husband fled to Thailand, where they lived in a refugee camp for the next twenty-five years. Now she lives in Portland, where she has taught herself English and is supporting her children as they progress through school and toward careers. She translates for neighbors when they need help, and often cooks for members of the community. She also works in the gardens, and helps sell produce at the markets, where she enjoys interacting with the customers and vendors. Guman grew up on a subsistence farm in Bhutan, but in the 1990's he and other members of the Nepalese minority were stripped of their citizenship and expelled from the country. 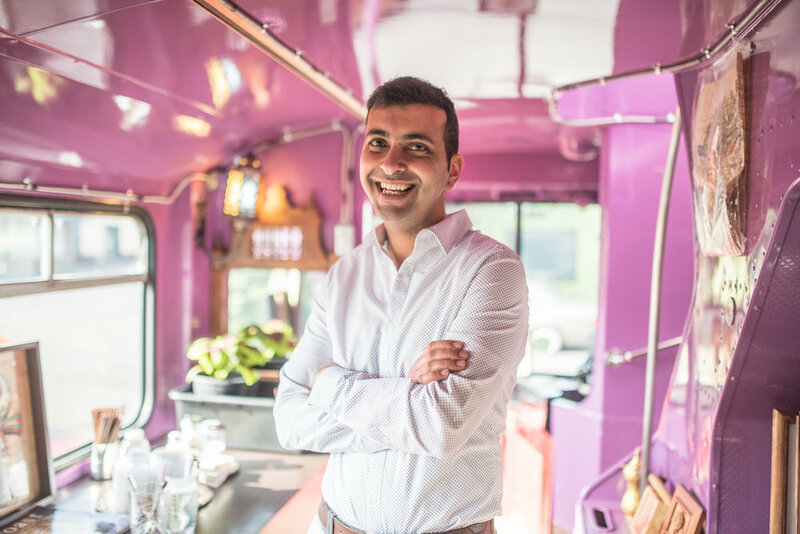 He and his wife relocated to a refugee camp in Nepal, where they lived for many years until they gained refugee status and moved to Portland in 2009. The transition was not easy for him--the first time he boarded a TriMet bus he used the back door, as he was accustomed to, and the driver shouted at him and kicked him off the bus. 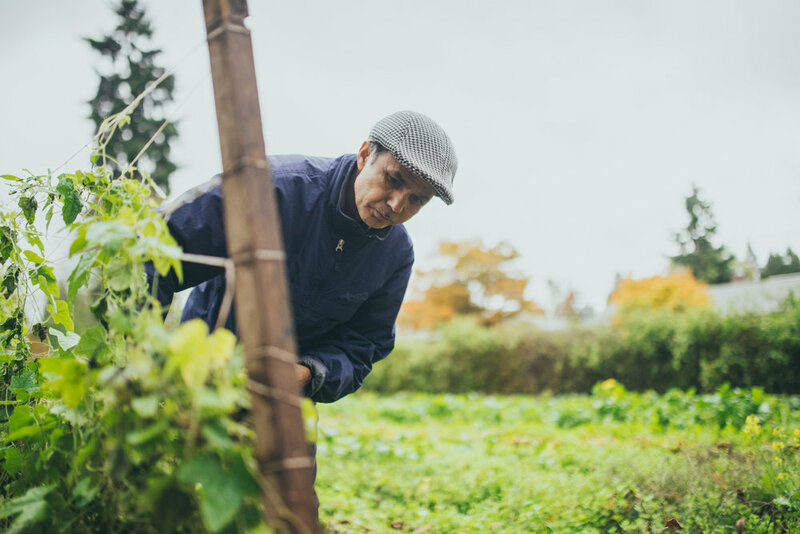 The Refuge Garden program has allowed him to become a leader in his community, and to augment his income from working as a janitor with profits from the garden.